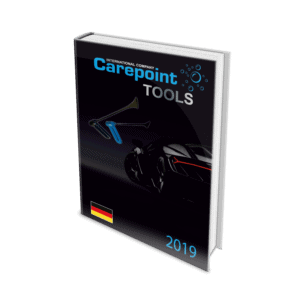 Carepoint represent PDR tool sets for paintless dent removal. Our experts have created these PDR tool sets for you. For that they have included the absolute minimum of the most frequently used equipment. Any Paintless dent removal technician should have these set of tools at his work. Carepoint PDR Sets combine our most popular PDR rods to operate dents on the car body. Therefore these PDR tool sets will allow you to effectively work on the dents which appear on the car surface due to hailstorms, reckless parking, collision or vandalism damage, for instance. Carepoint PDR tool sets contain rods, hooks and ‘whale tails’ that allow to work with the dents on the car roof, hood, braces and doors. We believe that you will find especially convenient to work with 360 degree adjustable handles of our tools.